US firm Studio Gang has revealed a 51-storey residential tower in Brooklyn, featuring scooped concrete windows and a curved elevated park. Newly released images show the 11 Hoyt development, which the firm's New York studio has designed for the site of a former car park, next to the Macy's store in Downtown Brooklyn. The condominium tower will be built to one side of the large plot. A garden raised one-storey above ground that will extend from the tower in a loop, curving round to connect to the other side. "We really saw the site as having the potential to bring a sense of openness and a sense nature into Downtown Brooklyn," Weston Walker, the design principal leading the project, told Dezeen. "We were thinking about how this project, with this really generous site, could introduce some green space and open space and nature into the neighbourhood," he continued. "That was a starting point for us and guided us as we developed the basic massing." Made of prefabricated concrete, the wavy facade will comprise curved volumes that protrude outwards at the sides to add extra space to the residences indoors. "The facade design is really about thickening the facade and adding to the living space in the unit," he said. "The prefab concrete facade system is designed to extend the living space out and create a zone at the end of the living space that has a window seat and can be used for storage," Walker added. "It's basically like an amenity at the end of your room rather than just a sheer wall of glass." Large windows, measuring eight feet (2.4 metres) tall will puncture the concrete. "It strikes a nice balance between tonnes of light and views from the large windows, and also giving the building on the exterior more of a robust materiality, a mineral sense that the concrete gives," said Walker. 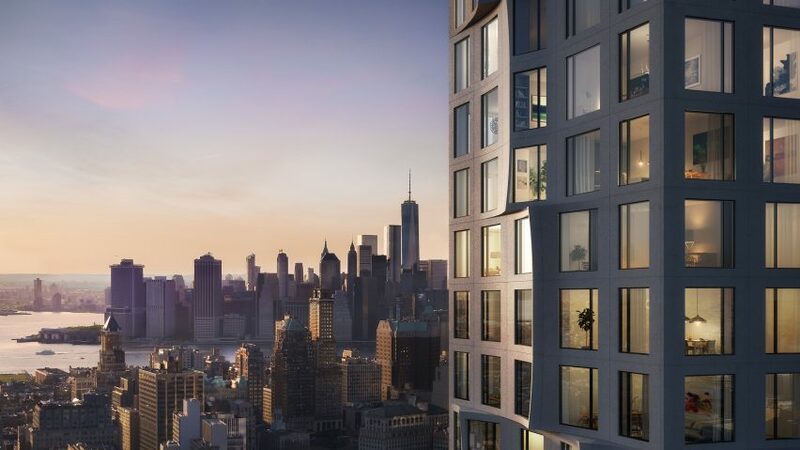 Designed for developer for Tishman Speyer, 11 Hoyt will include 490 residences of varying arrangements across its 51 floors. One similarity between the homes will be that the main living areas, like the lounge and master bedrooms, will be placed in the curved window bays. Studio Gang – which was placed at number 252 in the 2017 Dezeen Hot List of the world's most newsworthy forces in design – was founded by architect 1997 by architect Jeanne Gang. It has offices in Chicago, New York and San Francisco. The firm's other projects in New York include a High Line-hugging office building, which recently topped out, an extension to the American Museum of Natural History and a fire station in Brooklyn.